My kids love shenga chutney pitto, probably that is the only way they eat peanuts without a fuss. So I have been thinking to use similar combination with vegetables. 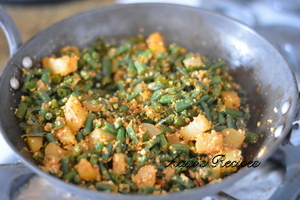 I have seen my Marathi friends adding a peanut powder to raitas, green beans and some other vegetables. So I prepared this nutty green beans last week and it was received pretty well, the two year old was pretty excited to (atleast) try the green beans. The roasted peanuts gave a nutty sweetish taste to otherwise spicy dish. The ginger gave a very good flavor to the beans. I am so used to adding potatoes to green beans, I feel potatoes pair really well with them. 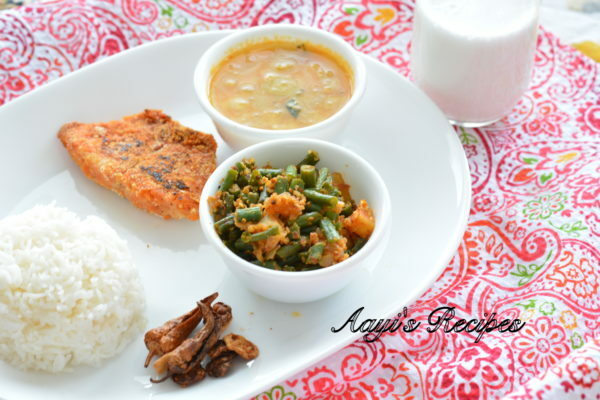 Today when I prepared the same dish, I added some chutney pitto to it instead of making the peanut-coconut powder. This was a good way to get some vegetables and also protein into the little tummies. 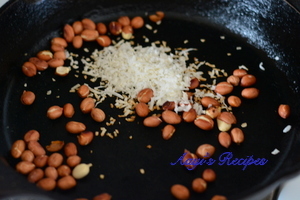 Dry roast peanuts and coconut and make a powder. Heat oil and add mustard seeds, urad dal followed by curry leaves, ginger, onion. Add green beans, potatoes and spices. When cooked, add the nut powder. 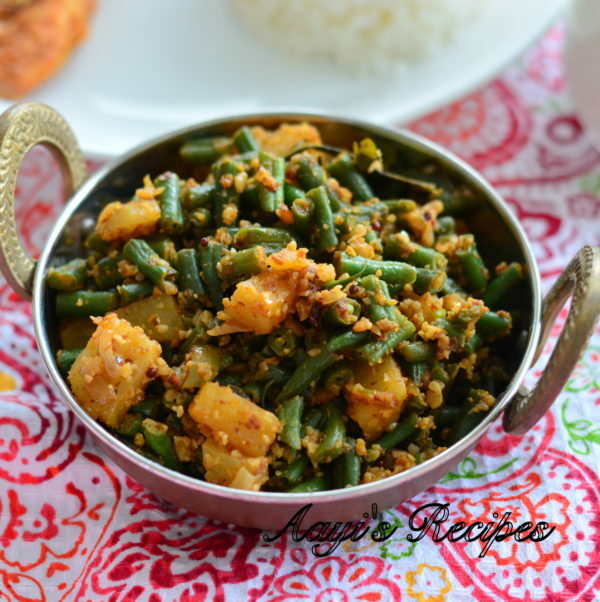 Green beans and potatoes cooked till they are soft and flavored with peanuts and coconut to give a sweetish spicy taste. 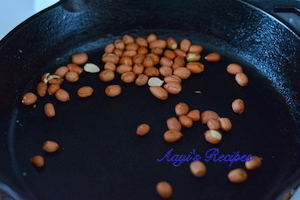 Dry roast peanut till they are brownish and then add dry coconut(or dessicated coconut). Roast till coconut is brownish. 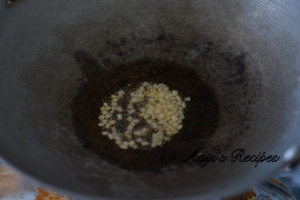 Grind them to a coarse powder and keep it aside. When they start popping, add urad dal. 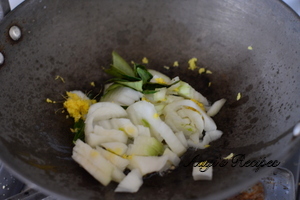 Fry for a min and then add curry leaves, ginger. Then add onion and fry till brownish. 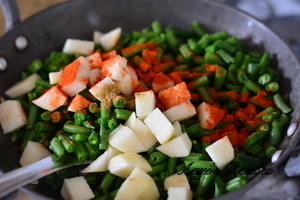 Add green beans, potatoes, chilli powder, turmeric, coriander powder and salt. Cover and cook on a medium-low flame till the beans and potatoes are cooked. Make sure to cook on low heat, since there is no water added, it will get burnt if cooked on high. Add the peanut-coconut powder and mix well. Take off heat and serve hot as a sidedish with rice or chapati. 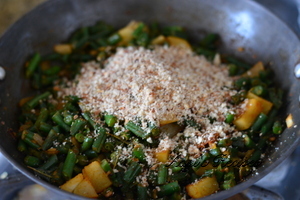 it looks v.yummy.i make green beans n potato with fresh grated coconut.now will surely try adding peanut powder. Thanks for sharing. I like beans that to with nuts feeling so yummy. Tried this dish the other day. Came out very tasty and delicious.The nutty combination of peanuts/coconut added a new flavor to the dish.